Jack Osbourne has today revealed his fiancé Lisa Stelly is pregnant with their first child. Only two weeks ago, the youngest member of the infamous Osbourne family confirmed his engagement to the aspiring actress. Osbourne made the pregnancy announcement whilst appearing on Piers Morgan Tonight alongside his parents, Ozzy and Sharon and admitted he was ‘excited’ but ‘a little nervous’ at the prospect of becoming a Father. 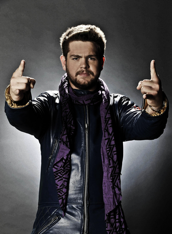 The 25 year-old rose to fame after appearing with his family in the MTV reality show The Osbournes. He went on to battle drug and alcohol addictions but has been sober since completing a stint in rehab in 2003.